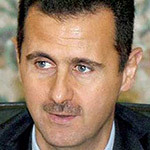 Bashar al-Assad, born 11 September 1965, is the current President of Syria and Regional Secretary of the Ba’ath Party. His father Hafez al-Assad ruled Syria for 29 years until his death in 2000. Al-Assad was elected in 2000 And 2007, unopposed each time. Following anti-government demonstrations in the Arab world, protests in Syria started on 26 January 2011. Protesters called for political reforms and the re-instatement of civil rights, as well as an end to the state of emergency which had been in place since 1963. One attempt at a “day of rage” was set for 4–5 February 2011, though it ended uneventfully. Protests on 18–19 March were the largest to take place in Syria for decades and the Syrian authority has responded with violence against its protesting citizens. By the end of January 2012, over 7,000 civilians and protesters had been killed by the Syrian army, Assad’s militia (Shabeeha) and Syrian security agents.